Stubb's Bar-B-Q Sauce is an authentic Texas barbecue sauce made the old-fashioned way, with all-natural ingredients (and it's gluten-free, too). The original developed by C.B. Stubblefield, aka Stubb, is a sweet & tangy blend of tomato, molasses and vinegar seasoned with just a touch of black pepper and spice for a big, bold flavor that brings out the best in beef while also beautifully complementing pork and chicken. It's the perfect barbecue sauce to serve with smoked brisket, or for saucing ribs at the table, mixing into ground meat for sloppy joes or meatloaf, and dipping fries and topping burgers as an alternative to ketchup. 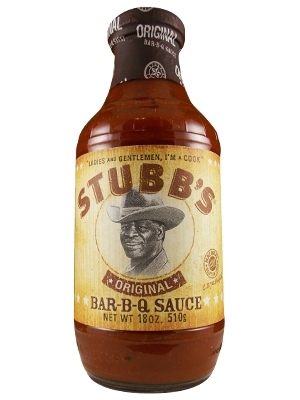 In addition to the Original BBQ Sauce, Stubbs also makes hot & spicy, honey-sweet, smoky and other variations, plus various different marinades, rubs, natural smoke liquids, and even a zesty wing sauce. We have them all! 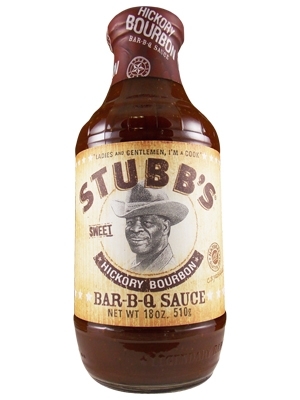 Stubb's has taken the classic original recipe and added a splash of real Kentucky bourbon and natural hickory smoke flavor for a masterpiece of a sauce that brilliantly balances sweetness with earthy smokiness and sassy tang. This all-natural sweet sauce delivers deep and complex flavor notes while remaining food-friendly (and kid-friendly, too). It will complement all sorts of smoked or grilled red meat, and also enhances chicken, wild game, shrimp and vegetable kabobs. A natural choice for brisket or London broil, Stubb's Hickory Bourbon BBQ Sauce can even be used as an alternative to steak sauce. Mix it into ground beef for the most amazing BBQ burgers ever, or add to meat loaf, baked beans or sloppy joes to elevate everyday meals to new levels of flavor. Slather it on baby back ribs and your family and friends will be asking for seconds (and even thirds). Originally developed for marinating pork, this outrageously flavorful and tenderizing Texas marinade can be used to marinate and baste any kind of red meat, including beef, venison, wild boar and more. Subtly exotic, pleasantly spicy, and heartily savory with a hint of sweetness, the all-natural ingredients include tamari sauce and tamarind, red pepper, garlic, lemongrass and ginger. You've never had grilled or broiled salmon until you've made it with Stubb's Pork Marinade! It's also incredible for all sorts of kabobs, or for marinating portobello mushrooms to make veggie burgers. You can also use it as a braising sauce in the oven, or in your slow cooker or crock pot. Some people even use it as a stir-fry sauce, or add it to rice and beans or hearty stews and soups for a flavor boost. The possibilities are limitless if you let your imagination and your palate be your guide. 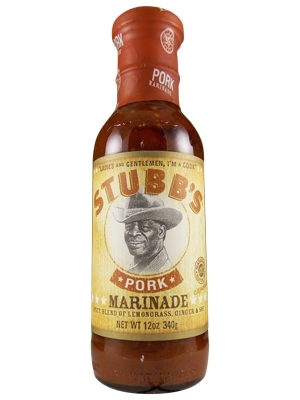 Like all of Stubb's sauces, Stubb's Pork Marinade is gluten free. This is where you'll find sauces, seasonings, snacks and other food products made in North Carolina, from genuine eastern NC vinegar BBQ sauce to tangy tomato & vinegar Piedmont (aka Lexington or Western NC) barbecue sauce. 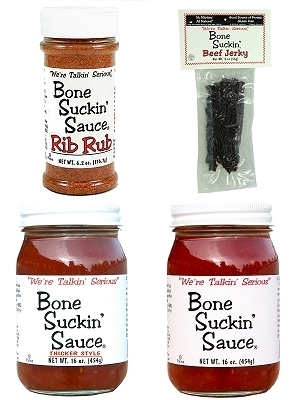 We offer the world-famous Bone Suckin' Sauce, the best-selling Wells Hog Heaven BBQ Sauce, and other barbecue sauces rarely found outside the Carolinas, plus hot sauces, marmalades, condiments and other North Carolina products, and officially-licensed sauces & gift sets from the UNC Tarheels, ECU Pirates and NC State Wolfpack. 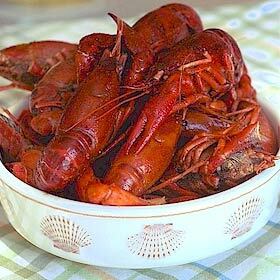 Buy Louisiana crawfish online and get your Cajun feast started! Wild caught from freshwater estuaries in Louisiana, your crawfish come already cooked and seasoned, then fully frozen and express-shipped, ready for you to reheat and enjoy. You get ten to fifteen premium crawfish per pound, and you can order 3, 6, 9, 15 or 30-pound packs. Click here to see current crawfish prices and specials, and to place your order online. Makes a thoughtful gift for Louisiana ex-pats and anyone else who misses crawfish or loves real Cajun and creole food.